Lesbian, gay, bisexual, and transgender (LGBT) Americans are less likely to have access to the same quality coverage as their straight counterparts. The new health care law addresses some of these disparities and introduces reforms to prevent unfair discrimination by health insurers, but there is still much work to be done! 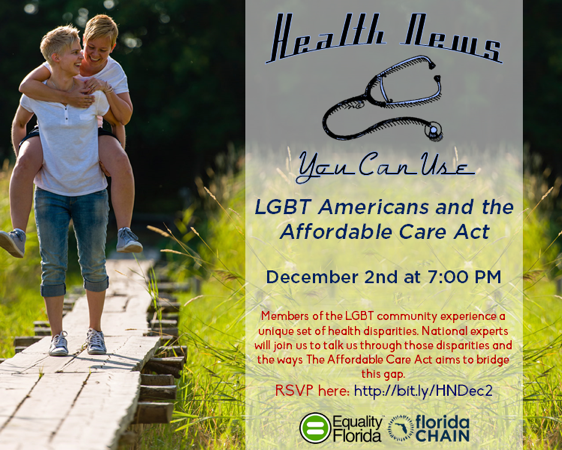 Join experts from Florida CHAIN, Equality Florida, Center for American Progress, and Community Catalyst for a special call that will cover the challenges LGBT Americans face when it comes to health equity, how the health care law addresses some of those, and the important work ahead to ensure health equity. PLUS: Hear from Florida leaders engaged in the fight for health equity and some easy ways you can get involved. This call is part of a brand new series called: Health News You Can Use. Every month we'll bring in an expert speaker to talk to you about a hot topic and then give you the chance to ask questions.